Infrared saunas bring numerous important health benefits in a convenient, revolutionary and classy solution, all in the comfort of your home and at affordable prices. Infrared heat provides all the healthy benefits of natural sunlight that our body needs but without any of the dangerous effects of solar radiation. For decades, the healthcare specialists have recommended infrared heat lamps as means of infrared therapy. The lamps, however, are cumbersome, really hot and difficult to maintain at a constant temperature. Carbon heaters used in home saunas emit a special bandwidth of tuned infrared light energy that penetrates human body tissues, muscles and its soothing warmth has therapeutic, healing and relaxing effect. Most certainly, a welcomed addition to your home! An infrared sauna is sometimes called a far-infrared sauna where "far" describes where the infrared waves fall on the light spectrum. A traditional sauna uses heat to warm the air, which in turn warms your body while an infrared sauna heats your body directly without warming the air around you. The appeal of saunas in general is that they cause reactions similar to those of moderate exercise, such as sweating and increased heart rate. An infrared sauna gives the same results at lower temperatures than does a regular sauna. This makes infrared saunas accessible to people who cannot tolerate the heat of a conventional sauna. But does that translate into tangible health benefits? Several studies have looked at using infrared saunas in the treatment of chronic health problems, such as high blood pressure, congestive heart failure, dementia and Alzheimer's disease, headache, type II diabetes and rheumatoid arthritis, and found certain evidence of benefit. Types of infrared home saunas differ based on the heater, wood and capacity. Some of the most common types of heaters include carbon heaters, mica heaters, and ceramic heaters. Carbon heaters are based on carbon fiber glass. They distribute heat equally and generate low surface temperature. In addition, they are quite flexible which is why they are found in many medical devices today. As carbon heaters are industry standard and the best option, we reviewed 5 best home infrared saunas with carbon heaters. Mica heaters are made from mica rocks. Although they have similar properties like carbon heaters, they are not as good as they are prone to cracking. Although not always not visible, the cracks they can reduce the efficiency of your sauna over time. Ceramic heaters were one of the first heaters used in home saunas. They are based on ceramic tubes, inexpensive and don’t require much space but they deliver high surface temperature. In addition, they are difficult to replace and provide uneven heat distribution. Hemlock or Nordic Spruce are the two most commonly used types of wood in modern infrared saunas. Hemlock is by far the most popular in the US. Both are a good choice because the texture looks beautiful and it also keeps the area safe from bacteria, mildew, and mold. They can be used for a good many years without worrying about splintering, cracking and bowing. When checking out the quality of wood, consider the thickness and find out what’s inside the panels. Infrared saunas come in different sizes and they can accommodate one, two or more people. The most popular are infrared saunas for two people. When considering the capacity of the sauna, think about the space you have available in your home. EMF stands for Electromagnetic Fields. After the first reports of the potential hazards that EMG brings, many of the top manufacturers of infrared saunas have decided to use technology that will emit low levels of EMF or even no EMF. Look for models with low EMF levels in Milligauss (mG). Otherwise, EMF exposure can lead to loss of energy, memory loss, headaches, fatigue, and irritability. DYNAMIC SAUNAS Maxxus Reims is a beautifully crafted 3-person corner infrared sauna with carbon heating panels. With the dimensions of 60” W x 60" D x 75” H, Maxxus Reims will bring healthy living and longevity to the privacy of your own home in a convenient and cost effective way. Modern technology and energy efficiency in FAR infrared carbon heating panels allow beneficial penetrating FAR infrared waves to remove body toxins and increase blood circulation. They also ease pain from sore muscles or aching joints, burn calories and improve skin tone. This model is constructed with the environment in mind which accounts for the manufacturer’s dedication to using Reforested Canadian Hemlock wood. The sauna walls are double paneled constructed with the thickest interior and exterior wood planks possible. The final result is a quality sauna that retains heat more efficiently, heats up faster and wastes less energy. This 3-person model has 9 infrared Carbon Energy Efficient heating panels (including an industry leading foot heater). They produce a wider, softer heat that is evenly distributed throughout the sauna. The infrared Carbon Energy Efficient heating panel heaters are 30% larger than saunas heated by ceramic tubes and penetrate skin 40% more to maximize therapeutic benefits. Maxxus Reims 3-person sauna is designed for ease of use and is an outstanding value for money. It is user-friendly and conveniently operated using the soft touch control panel and LED display. It is very spacious and comfortable to sit in. Every sauna is equipped with floor and lower bench heater to allow the same benefits and treatment to your legs and feet. Enjoy your sauna relaxing and therapeutic session with your favorite music using the built in FM radio, CD and MP3 auxiliary connection with speakers. The sound system has a remote control, which is a cool feature. The sauna plugs into a dedicated 20 amp 120 volt outlet. It is highly recommended to consult a certified electrician for replacing a 15 amp dedicated receptacle to an approved 20 amp dedicated receptacle and 20 amp breaker. The sauna can be installed in about an hour in any of the designated corners at any indoor location including your master bathroom or walk in closet, in the home gym or your basement. This model is designed for indoor use only. JNH Lifestyles Infrared Sauna is an indoor sauna for 2 people. A few dozen minutes inside will help you relax your muscles, relieve stress and feel more rested than spending hours getting costly massage. You can fit it in even in small spaces in your home because its dual wall construction allows you install it without worrying about heat expansion or insulation. The sauna measures 75″ H x 47.3″ W x 39.5″ on the exterior and the inside dimensions are 72″ H x 45.3″ W x 37.5″ with a 65” H x 23” W door. This model is made of 100% quality Canadian Hemlock wood, There are no chemicals added and no plywood used in manufacturing. The door is made of a special safety glass which can tolerate high temperatures. The door provides better insulation and allows you to have unobstructed view of your home, which is great for those who might be suffering from claustrophobia. JNH Lifestyles Infrared Sauna produces heat emitted by 7 high-quality carbon fiber far infrared heaters which are located at the back, side and lower part of the unit for improved and more efficient heating. Instead of heating the air, the benches or stones, these infrared heaters will heat the body, which makes the heat use more efficient. There is no water used and no steam is formed but the benefits of using this sauna exceed those of conventional ones. The heat output ranges from a minimum of 64 degrees Fahrenheit to a maximum of 140 degrees Fahrenheit, depending on your needs and preferences. Apart from losing a few extra pounds, this sauna has detoxifying properties which will help you remove the toxins from your body and improve the vitality of your organism. In addition, your skin will benefit from the effects and will look healthier, cleaner and shinier as all the impurities are released through sweat during the sessions. The inside of the sauna is lit with long lasting LED lights that not only provide a stronger light but that are also 50% more cost-efficient than regular light bulbs. To make your sauna experience even more enjoyable, there are 2 quality speakers with adjustable volume and an auxiliary plug so that you can enjoy your favorite tunes while you relax, burn extra calories and heal. User friendly installation means that you simply need to buckle the panels together. It’s also easy to take it apart and transport if necessary. There is no additional wiring required: you only need to plug the mains in and you are ready for relaxation. This far infrared sauna is designed so you can easily operate it and enjoy the benefits with no hassle. The digital controls are easy to understand and use to easily control and adjust the temperature and the duration of each sauna session. You can relax on the seating bench knowing that you are safe inside and savor every moment. The durable materials and the solid construction are backed by the 5-year warranty provided by the manufacturer. DYNAMIC SAUNAS Venice will provide perfect moments of soothing relaxation and health beneficial infrared heat effects at your home. The comfortable moderate heat will allow you to enjoy its benefits regularly without health risks. The ease of use makes it a great addition to your home health-oriented facilities with a reasonable price tag. Using this sauna will be a comfortable experience thanks to the perfect temperature level that it reaches. This ensures you won’t be sweating more than enough for a healthy sauna session. The sauna has a special feature - a chromotherapy lighting system with 9 available colors that increase its health benefits. Besides the relaxation experienced, you can also enjoy the benefits provided by various light colors that increase saunas functionality. Visible radiation using 9 different colors improves the overall proper functioning of your vital organs and accelerates the detoxification. The infrared heater placed at foot level aims for full body coverage and offers an intense session that stimulates blood circulation from head to toe. Enjoy the practical and convenient double control panel with LED display. It enables you to adjust the temperature and the duration of the session from both the inside and the outside the unit, compensating for the lack of a remote control. This model uses 6 low EMF far infrared carbon heater panels that create a uniform and soft heat which is distributed for maximum body coverage. According to specifications, the heaters reach around 2.5 mG at 4 inches away from the heater so you don’t need to worry about radiation. The sauna measures approximately 50” x 42” x 77” at the exterior and 43″ x 37″ x 70″ at the interior. It weighs about 400 pounds, so it’s recommended that you find a permanent place for it. The clasp together assembly is very convenient for DIY installation. Once plugged in, no additional wiring is needed. While you relax in the pleasant temperature, you can play your favorite music using the built-in MP3 auxiliary connection with speakers. DYNAMIC SAUNAS Barcelona is a beautiful but sturdy sauna made of a quality reforested Canadian Hemlock wood which is resistant to heat and that will last great many years. The classy design is enhanced by the bronze privacy tempered glass and the side glass insertions that add more light to the inside. Being so slick in design helps it blend with any interior. Unlike ceramic heaters that require frequent replacements, the 6 Low EMF energy-efficient carbon heaters installed need no replacement at all. 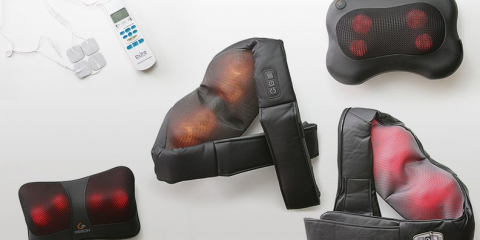 These heaters are 30% larger than ceramic heaters and are spread to ensure a wider coverage and a higher infrared penetration through your skin for increased therapeutic benefits. While other models reach extreme temperatures of 200 degrees Fahrenheit, this sauna only reaches 130 degrees Fahrenheit, so you will be safe and comfortable the entire session. The recommended operating temperature is 120 degrees Fahrenheit, so you will be able to enjoy a pleasant and relaxing experience for longer and enjoy all its multiple health benefits. The clasp together assembly means that you will manage to install the unit yourself. It then plugs into a regular 15-amp 110-volt outlet and there is no need for any additional special wiring. You can install it on a carpet in any room of your house including bathrooms, basements or garages. It heats up very quickly thanks to the double-walled panels which lock the heat inside and so prevent heat loss which would result in energy waste. As for durability, the lifetime warranty says a lot about the quality and the reliability of the manufacturer. If you handle the unit properly and only install it indoors because any sign of wear due to an improper installation or handling will void the warranty. 1-2 Person Hemlock Infrared Sauna by Radiant Saunas is a safe, effective and affordable way to relieve stress and improve your health in the comfort of your own home. This sauna uses the latest in InfraWave FAR heat technology to emit ultra-low levels of EMF, making it safe and beneficial to your health. Built from the Solid Hemlock Wood and using buckle construction, this model is super easy to assemble. The compact size means no wasted space or energy and time for the sauna to heat up. It reaches the full temperature of 140 degrees in about 20 minutes. It is certainly built to last, providing you with years and years of health benefits, detoxification, relaxation and stress relief. This sauna can comfortably seat 1 to 2 people on the extra deep bench that runs along the back wall of the sauna. The EZ-touch dual interior and exterior LED control panels allow for easy temperature control. It features 4 energy efficient carbon heaters, and comes equipped with a built-in auxiliary port, auxiliary cord and 2 premium pre-installed speakers. This unit by Radiant Saunas operates on a safe 120v/15-amp power and has CE, CETL, RoHS and ISO 9001 certifications, internationally-recognized seals of quality, safety, and professional manufacturing. You can easily assemble it in less than an hour and start enjoying the benefits of infrared carbon heaters, stay healthy, relaxed and stress-free for a long time. For your peace of mind, it is backed by 7-year limited warranty and 5-year warranty on wood, structure, and heating elements and electrical.